KYOTO, Japan--(BUSINESS WIRE)--Kyocera Corporation (TOKYO:6971) today announced that its subsidiary, Kyocera Senco Industrial Tools, Inc., a U.S. pneumatic and cordless power tool manufacturing and sales company based in Cincinnati, Ohio, has concluded an agreement to acquire 100% of the shares of Van Aerden Group BV, a European pneumatic tool manufacturing and sales company. 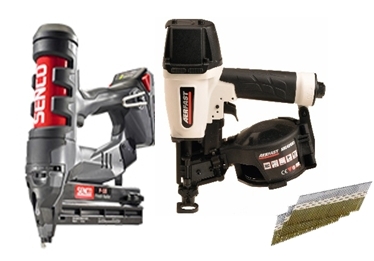 In addition to manufacturing pneumatic tools and related products, Van Aerden Group sells power tools under multiple brands, including Senco, as a distributor. Effective March 1, 2019, Van Aerden Group BV will be renamed Kyocera Aerfast Europe BV. With the manufacturing and sales assets brought by this acquisition, Kyocera aims to strengthen its pneumatic tool business in Europe. In recent years, Kyocera has expanded its tool business by diversifying from its core line of industrial metal processing tools. It entered the pneumatic tool business in Northern Europe and Germany in 2011 through the acquisition of the Unimerco Group (now: Kyocera Unimerco A/S). In 2017, Kyocera acquired Senco Holdings, Inc. (now Kyocera Senco Industrial Tools, Inc.), known for its broad range of high-quality pneumatic and cordless power tools in the U.S., the world’s largest market for nailers. Van Aerden Group manufactures the Aerfast brand of pneumatic tools, including nailers and staplers, with sales operations in more than 10 European countries. Van Aerden Group has already built a strong collaborative relationship with Kyocera as an important European distributor for Kyocera Senco Industrial Tools since August, 2017. Kyocera Senco Industrial Tools, Inc has concluded an agreement to acquire 100% of the shares of Van Aerden Group BV.